El Embrujo Restaurant and La Lola Tapas bar, which specialise in traditional Spanish cuisine, can both be found in the same building on the South-West coast of the Spanish island of Tenerife. The restaurant provides an authentic taste of many different parts of Spain in both the Spanish food and Spanish culture and entertainment available. El Embrujo Restaurant and La Lola Tapas bar is a relatively new establishment, opening in Tenerife in March 2011 - albeit with a huge Spanish style party to celebrate! This restaurant has already become a favourite eatery amongst both the tourists who visit Tenerife and the locals who live there. The restaurant is situated in a shopping zone called the Commercial Centre of America Square, which is filled with many great restaurants and bars. However El Embrujo restaurant remains the only gastronomic restaurant there to date. The decoration of the restaurant and tapas bar is typically Spanish, with some clear Andalusian and Castilian elements, to mirror the food being served. 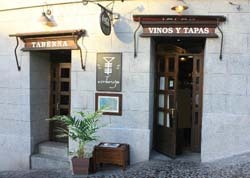 La Lola, the tapas bar, is decorated with typical white and blue tiles over which hang many Iberian legs of ham along with a fantastic collection of Spanish wine. Outside, you can enjoy a glass of these wines at the rustic style wooden bar whilst appreciating the water fountain and enormous crystal chandelier. The restaurant is also filled with typical Spanish imagery and objects. The walls above the main eating area are covered in paintings of famous Spaniards such as Salvador Dalí, famous images such as Spanish bulls and, of course, famous Spanish foods such as paella and wine. Clearly the emphasis at this Spanish restaurant is on the traditional Spanish food; however some attention has also been devoted to the love of Flamenco dancing and music. If you look at the walls of El Embrujo you will find a multitude of paintings and photos of Flamenco dancers and musicians. Furthermore, the restaurant puts on Flamenco shows everyday during the evenings for you to enjoy while you eat and drink. This place lives and breathes Spanish culture and heritage and it is therefore the perfect place if you want to study Spanish culture. The staff members at El Embrujo restaurant are not only extremely polite and efficient but they also speak a range of languages so you don't have to study Spanish to be able to enjoy the restaurant - but it could be a lot of fun if you did practise your Spanish with the menu and the staff! El Embrujo Restaurant serves a variety of Spanish food from across the Spanish peninsular. 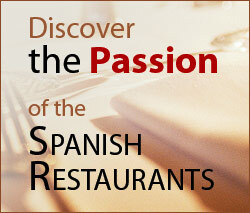 In the menus you can find dishes from Andalusia, Galicia and Castile as well as a few dishes from Tenerife too. Some of the typical Spanish dishes include 'tortilla española' (Spanish omelette), paella, fish and other meats. Despite being a Gourmet restaurant, on the Gastronomic Route of Tenerife, this Spanish restaurant balances quality with price making it an affordable treat for everyone. The La Lola Tapas bar offers a typically Southern Spanish experience with a great selection of Spanish tapas available which are best accompanied by either a superb Spanish beer or a glass of Spanish wine. The wine cellar for the restaurant can be found in the middle of the restaurant, in plain view of the restaurant's clients, adding to the decor of the room. From your seat you can also see the chefs in the kitchen preparing your meal which adds to the whole experience provided by El Embrujo Restaurant. On a special occasion, El Embrujo Restaurant also cooks a giant paella measuring around one metre in diameter. This paella is so big that it needs to be cooked outside on a special stove as it will not fit in the kitchen. To this paella they add rabbit, chicken, prawns, saffron and other ingredients before serving it to the customers. This paella is not only delicious but a spectacle in itself.